The lob is one of the hottest styles in hair today. From celebrities to everyday people, this look is everywhere! The lob is a great- looking, low-maintenance style that anyone can wear. Whether your hair is straight, wavy or curly, the lob offers ease and elegance. The most replicated style of the lob is Jennifer Aniston's cut, which is an inverted lob. It rests just below the collar bone in front and is slightly shorter in the back with layering just around the ends to make it slightly frame the face. For straight hair, this is a wash-and-go style. For wavy or curly hair, the hair will need to be flat ironed. A dab of anti-frizz cream or gel is all this style needs to remain looking good. This is another inverted lob option. It is shown here without layers, but it can be worn with light layering. This version has a very long side bang parted to each side, and nearly anyone can wear this style. Curly or wavy hair should be flat ironed to get the straight look, but this cut also works well leaving the hair curly or wavy. Either way, a curl cream with anti-frizz serum or smoothing cream should be used to maintain the style. Anne Hathaway has a perfect example of a longer lob without layers or bangs. This cut is perfect for straight or slightly wavy hair. Styling it is as easy as applying mousse to damp hair and using a large round brush while blow drying. This style works well for anyone trying to grow out full bangs or anyone with thinning hair. Curly or wavy hair will have to be flat ironed to get the look. This style is layered with a long side bang blended into the layers. Use a texturizing taffy or light wax to hold the bangs where you want them. Sandra Bullock's lob rests at the top of her shoulders with face-framing long layers. This cut is perfect for straight, heavy hair. To style, simply use a large round brush while blow drying. This style is just above the shoulder with full face-framing bangs. It is a perfect option for girls or women with straight hair. Style it with a smoothing serum and use either a flat brush or a flat iron while blow drying. This lob is cut similar to a shag, only longer. This style works well for people with straight, fine or thinning hair since the layers give volume. To style, use a volumizing mousse and brush while drying. When dry, lift the hair slightly with your fingertips and spray lightly with hairspray. This is a perfect, low-maintenance style for straight hair. 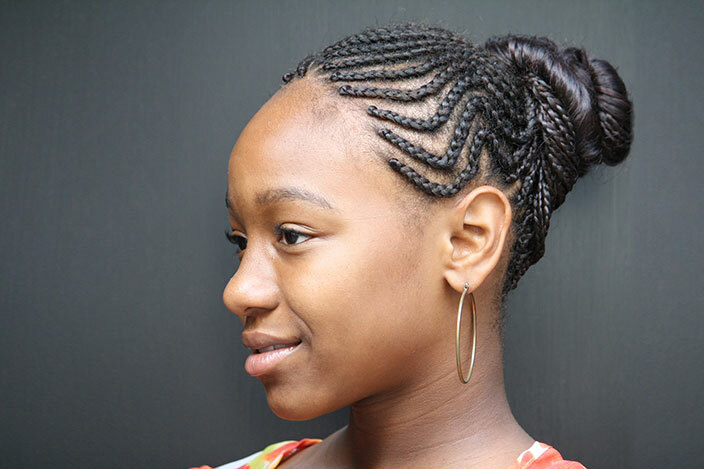 This style rests on the shoulder, has no layering, and has deep side bangs. Use a texturizing taffy or light wax to hold the bangs in place. Taylor Swift's slightly-layered cut with full bangs is a perfect style for naturally wavy hair or hair with a loose body perm. Style with a bit of curl cream or mousse while scrunching the hair and let it air dry. For volume, use a blow dryer. This style has no layers and rests on top of the shoulders, and the front is cut to frame the face with full bangs. It's perfect for straight hair, but anyone can wear it. Wavy or curly hair will need to be flat ironed using a smoothing serum. This cut is perfect for little girls with thick, curly hair that has been straightened. It rests on the shoulders and has no layering or bangs. A large curling iron can be used to bend ends slightly. This cut is the most popular lob style for little girls with slightly wavy or straight hair. This style has no layering, and rests just above the shoulder. For straight hair, use a round brush while blow drying to get the curled-under look. You could also use a curling iron to achieve the same effect. Naturally wavy hair just needs a round brush during or after drying to get the ends to flip under. Curly hair like Julia Roberts' needs long layers cut to keep it from looking like a helmet. For a curly lob style, use a curl cream mixed with anti-frizz serum and let the hair air dry. This is a classy style, especially for women with straight hair and an oval face shape. There is no layering to this style. Apply a smoothing serum before drying and then finish with a flat iron to get that perfect blunt look. The lob looks great, is very flattering, and needs very little product to maintain the style, although it does need some form of anti-frizz product, especially in humid conditions. This style can give the appearance of a longer neck, and an inverted lob can give the appearance of weight loss. These are just a few of the many other reasons to love the lob.